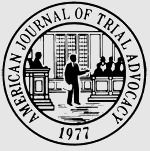 The American Journal of Trial Advocacy is the nation’s oldest law review dedicated to the advancement of trial advocacy. Learn more. The American Journal of Trial Advocacy is the nation’s oldest law review dedicated to the art of trial advocacy. Through the efforts of the late Dean Donald E. Corley, the American Journal of Trial Advocacy was founded in 1977. Dean Corley believed demands were rising throughout the profession for increased study and analysis of trial advocacy as a specialty within the law. Traditional law reviews had been unable to meet these demands because oftheir emphasis on a theoretical analysis of the body of the law rather than actual litigation practices. The American Journal of Trial Advocacy publishes articles authored by prominent attorneys, judges and clinical professors throughout the country. These articles address proven tactics and techniques at the pre-trial, trial and appellate level. Student-written notes, comments and recent developments focus on new developments in the law that most directly affect trial practice and procedure. In its fourth decade of publication, the Journal has tremendous potential for breaking new legal ground and supplying the largest section of the national Bench and Bar with unique, practical scholarship. The Journal categorizes manuscripts by topic and intended audience: articles, commentaries and trial or courtroom techniques. Commentaries allow authors to discuss controversial topics that may be outside the scope of a full-length article. Articles are thoroughly researched discussions of new theories of law applicable to the trial attorney’s practice. Trial techniques, unique to the Journal, are how-to discussions of proven trial tactics that include supporting case law and other research. Journal members are selected from a highly competitive candidates writing program. Students ranked at the top of their class and select winners of writing and advocacy competitions are extended invitations to participate in the program, which consists of a write-on competition and Bluebook examination. This competitive admittance program ensures a continued high level of quality throughout the American Journal of Trial Advocacy’s writing and editing process. An invitation to participate in a Writing Program for membership on the American Journal of Trial Advocacy is an honor extended to eligible Cumberland students who earn the privilege to write for membership. The Journal offers two annual Writing Programs, one in the summer and one in January. Important: First year law students who think they might be eligible should submit their summer contact information to the Journal by the first of June to avoid delays in receiving an invitation to participate in the writing program. Review our Summer Writing Program Schedule and fill out our Summer Contact form. The American Journal of Trial Advocacy is published twice a year by students of Samford University's Cumberland School of Law. Subscriptions are $24 per year ($15/issue), payable in advance, and are renewed automatically unless canceled prior to publication of the summer issue. Please fill out the Subscription Order Form if you are interested in purchasing a subscription. The Journal is dedicated to the art and science of trial advocacy. Accordingly, the Journal categorizes manuscripts by topic and intended audience: articles, commentaries, and trial or courtroom techniques. Commentaries allow authors to discuss controversial topics that may be outside the scope of a full-length article. Articles are thoroughly researched discussions of new theories of law applicable to the trial attorney's practice. Trial techniques, unique to the Journal, are how-to discussions of proven trial tactics that include supporting case law and other research. Scholarly writing requires proper citation of authorities for legal assertions. Further, scholarship often benefits from citations to further material which may aid the reader in utilizing the provided information. The Journal follows the legal citation rules in the most recent edition of The Bluebook: A Uniform System of Citation. Articles are typically 5,000 to 8,000 words in length (25-50 double-spaced pages). However, the length of a manuscript ultimately depends upon the nature of the topic and its treatment. Trial Techniques, which are often more "how-to" pieces, are sometimes shorter in length (15-30 double-spaced pages) and contain fewer footnotes (25-100). Copyright remains generally with the author, though the Journal retains certain copyright privileges in order to facilitate reproduction on research databanks such as Westlaw and LexisNexis. Authors will be asked to sign an agreement that sets out the terms of publication. The Journal acknowledges the right of authors to use their material in future publication efforts, however. Reprint permissions are freely granted to others upon their proper acknowledgement of the Journal's copyright. The Journal furnishes all authors with two copies of the issue in which their article appears, along with an exact PDF of the article. Bound reprints of articles are available to authors at reasonable cost. The editorial staff reserves the right to make necessary editorial changes, though all possible deference is given to an author’s style of writing. Authors are provided final copies of their manuscript for review just prior to publication. The Journal reserves the right to accept or deny publication of any manuscript. Should problems arise regarding publication of an article, the editors will make every effort to work with an author. The Journal uses WordPerfect and Microsoft Word in the production of its books. We welcome submissions in either format via email. If you wish to mail your manuscript, please submit two (2) hard copies as well as a copy on CD or diskette to the mailing address on our contact page.